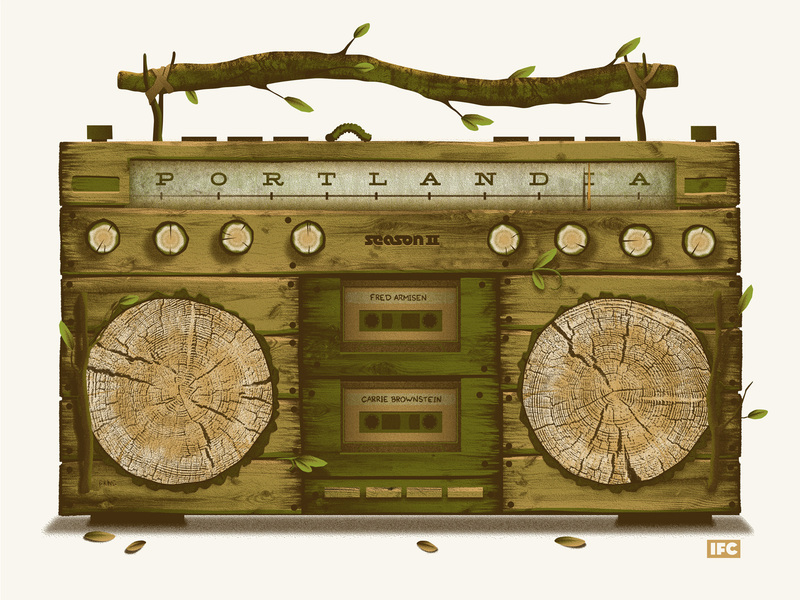 The sketch comedy series Portlandia, starring Fred Armisen and Carrie Brownstein and now in its third season, humorously riffs on social life in Portland, Oregon. The show skewers–or is it homage?–a range of Portlander-types, from self-employed creatives to self-absorbed nouveau yuppies to touchy-feely uber-alternative characters almost beyond precise description. Portlandia excels at noticing the many small details that help define a social scene–how people dress, how they talk and interact with one another, and what they value. Since both Armisen and Brownstein are musicians (Armison was a drummer before he became an actor and Brownstein was a guitarist and vocalist in Sleater-Kinney before forming her current band, Wild Flag) it comes as so surprise that music is a frequent feature of the show. In its music-themed sketches, Portlandia illustrates just how powerful music is to our sense of self and community. Below are three examples. In a sketch called “The Studio”, Fred plays an amateur home recording enthusiast and gearhead who invites his friend Lance over to his house to check out all of his specialized gear. Fred’s character is obsessed with vintage equipment, and shows Lance his keyboards, amps, microphones, and drum set. With a perpetually wide-eyed and spaced out look, he keeps referencing the Beach Boys’ Pet Sounds as a kind of pinnacle example of studio-recorded music and hopes that one day someone will actually come visit his basement set-up to record. In the “Wanna Come To My DJ Night?” sketch, Fred and Carrie realize, to their growing horror, that everyone around them has become a DJ. What is happening to the world? In the “One Party At A Time” sketch, Fred and Carrie play unemployed millennials who attempt to make sense of their post-college lives and channel their vague political aspirations through meaningful music. “I feel like we need to mobilize. Like in the 60s there was Woodstock…people rallied around something. There was a protest song” says Carrie. A robot “Bot Dylan” suddenly appears to pitch a millennial protest song whose hook is “change the world one party at a time.” The song is catchy and its 4/4 electronic dance music thump transports Fred and Carrie’s characters and those around them to the club, brainwashing them into forgetting what they were protesting in the first place. Even sketches that have nothing to do with music can have a musical quality. In the “Knot Store” sketch, the singular Jeff Goldblum plays an eccentric proprietor of a store that sells knots of string. The “music” in this sketch is 100 percent Goldblum’s voice itself. Listen to how he makes every utterance different in intonation and cadence, continuously changing up his delivery. Listen to his introduction (“My name is…Alan”) that slows, pauses, and dives to a low pitch on his name; listen to him answer Carrie’s questions about whether knots are a utilitarian or an aesthetic thing with parallel quick staccato replies (“nope…yep…”) followed by a deep and affirmative “yeah….” that swirls over several pitches; and listen to his sound effects too, as when he rolls his tongue at the end of a sentence that explains tangled iPod earbuds as a kind of sculpture (“An artist we work with makes these by jamming them into his pocket…rrrrr“). I’ve watched this sketch a dozen times. Oh so very musical! I recently watched a few episodes of the animated HBO series, The Ricky Gervais Show (based on the popular audio podcast of the same name), on which Gervais and fellow comedian and writer Stephen Merchant chat with their perfectly round-headed friend Karl Pilkington on any topic they feel like just to hear what Karl might say. The voices of all three are engaging, but it’s that regular bloke Karl who steals the show. Karl has a simple yet startlingly original take on life. Gervais and Merchant ask him for his opinion on a variety of topics with the aim of making fun of him, yet Karl always manages to surprise and elicit delight both because and despite what he says and the monotone way in which he says it. Karl’s voice is small, tentative, and deadpan, but he is always strangely thoughtful.